Coral Sea liveaboard departures on Spirit of Freedom are from the main jetty in Cairns every Monday. 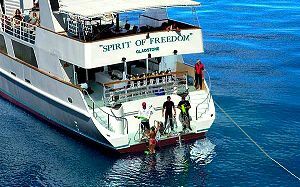 Spirit of Freedom is a sleek vessel with high quality accommodation, gourmet meals and excellent diving facilities for serious certified divers looking for a unique diving adventure. Australia liveaboard dive trip are also available. All of our cruises dive the Cod Hole as well as many other Coral Sea dive sites. All cruises also incorporate a low level flight over the Coral Sea and Great Barrier Reef. The flight is quite unique in the world and makes a spectacular addition to a great adventure. This cruise is very popular with international divers and is usually booked out up to two months in advance. Booking well ahead of your planned departure date is absolutely essential. See our full Australia Scuba Diving Trips selection here. Monday: Our bus will pick you up from your Cairns hotel around 11:00am to transfer you to Trinity Wharf to board the vessel. You will be greeted by the Spirit of Freedom crew, and receive an orientation of the vessel before departing at noon. Lunch will be served on board while we are cruising to the outer Great Barrier Reef for an afternoon refresher dive followed by a twilight or night dive. After dinner we will head north to the Ribbon Reefs. Tuesday & Wednesday: You will be diving at the most northern of the Ribbon Reefs, Number 9 & 10 Ribbon Reefs. Weather dictates the best dive sites but will always include at least one dive at the Cod Hole, where you will meet a family of massive and very friendly Potato Cod. Diving Coral Sea sites include Wonder-wall, Pixie Pinnacle, Challenger Bay, Two Towers, Lighthouse Bommie, and the Snake Pit plus many more. If the current is suitable, you may also do a drift dive at Dynamite Pass, well known as a channel where sharks pass through. Four to five dives will be available each day, including a night dive on the Tuesday. On Wednesday evening we will spend the night at Watson's Bay on Lizard Island and enjoy a sunset BBQ dinner on the top deck. Thursday: After breakfast on board you will be able to go ashore at Lizard Island. An opportunity to stretch you legs on land at this half way point, you can take the guided walk from Watson's Beach to Mary Watson's cottage over Chinaman's Ridge and back to the beach. Around 11.00am we will cruise back to Ribbon Reef Number 10 for two dives at a choice of sites which include the Snake Pit, Cod Hole, Challenger Bay, Lighthouse Bommie, Pixie Wall, and Pixie Pinnacle. Tide permitting we may repeat a dive at the Cod Hole or visit new sites. In the evening we depart for a 10 hour crossing to Osprey Reef in the Coral Sea. Friday & Saturday: 2 days will be spent diving a number of different sites at Osprey Reef (weather permitting). Visibility on Australia's Coral Sea reefs can be from 30 to 100 metres. The underwater terrain is amazing with sheer walls laced with gorgonians, sea whips, and brightly coloured soft corals, rising from the ocean floor thousands of feet below. 'North Horn', a dive site at the tip of Osprey, is a site where grey reef sharks, silvertips, and the occasional oceanic shark congregate. You can experience a close encounter with the Spirit of Freedom shark attraction dive. Four to five dives will be completed each day, including a night dive on the Friday. Saturday night we depart Osprey Reef for an overnight cruise to the Ribbon Reefs. Sunday: At Ribbon Reefs Number 3 diving includes such wonderful sites as Steve's Bommie, Temple of Doom, and Flare Point. Another option for Sunday, in special weather conditions, is to cruise south to Bougainville Reef, known for its stunning underwater landscape and caverns, and its partially submerged wreck. On Sunday evening we cruise back to Cairns overnight. Light aircraft regulations limit baggage to 20 Kg (45 LBS) pp. Excess luggage storage is available at the office. Once your enquiry has been received we will confirm whether places are available on the dates that you have chosen. You will then receive directions for payment of a deposit to secure your place on the cruise. The balance owing is paid on board prior to departure. Deposits can be paid using our secure (SSL) booking form or by credit card via telephone.